Sachem Uncas led the Mohegans with guidance from his councilors. The tribal nonners (grandmothers) and sagamores (sub-chiefs) advised the Sachem. Uncas’s life was infamously fictionalized in the classic novel “Last of the Mohicans” where the character Uncas’ suffers a sudden, violent death spelling the downfall of his people. 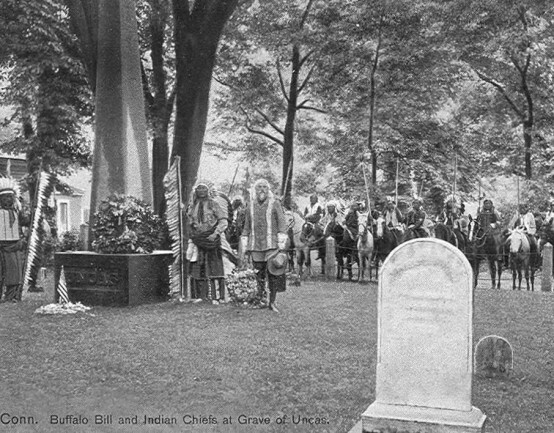 Unlike this literary misrepresentation, the real Uncas lived a long life, fathered many children, and forged a legacy of strategic cooperation with the English immigrants and Crown. Uncas’ attempts at cooperation were not always viewed favorably by the other tribes who used alternative means to resist the European incursions into the region in the seventeenth century. When Uncas remarked, “Yo mutáh mutu nutáh, wipi kutáh – This heart is not my heart, it is yours,” he affirmed his support of colonial associates with whom he had cultivated relationships and trust. In return came expectations of mutual alliance, goodwill, and responsible conduct. The memorial to Sachem Uncas was first dedicated in 1833 in the presence of President Andrew Jackson and Secretary of War Lewis Cass. Jackson had recently supported the Indian Removal Act of 1830, part of an intensely contested policy-making effort to remove indigenous people from their valuable Eastern lands. A second dedication followed in 1842 after mounting the obelisk. Buffalo Bill Cody and his cast of western Indians and cowboys visited in 1907 when Occum, Lemuel Fielding was presiding as chief. Cody placed a wreath on the monument. When U.S. President William Howard Taft visited on July 2, 1907, he shook hands with tribal members in attendance.